George Charles Scott Jr. was born in Greenville, Mississippi, on 23 March 1944. His father died when he was two. His mother, Magnolia, worked three jobs to support her family, and young George worked in the fields, picking cotton. After graduating from Coleman High School, he signed with the Boston Red Sox on 28 May 1962, receiving a ten-thousand-dollar bonus. Scott turned down college scholarships to play football and basketball because “that $10,000 was all the money in the world.” Scott made his Major League Baseball debut with the Red Sox on 12 April 1966. 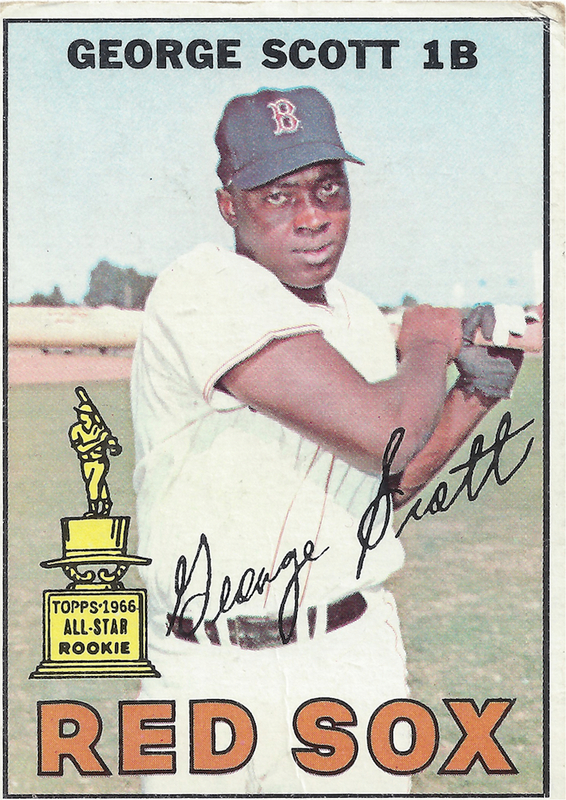 Just five years earlier, the Red Sox had become the last Major League team to integrate, and Scott was among their first African American everyday players. He earned his nickname when fellow rookie Joe Foy saw Scott hit and said, “Man, you really put a boom on that ball.” Scott hit 27 home runs during his rookie year, though the Sox finished in ninth place in the American League. The next year, however, Scott and the Red Sox finished in first place and reached the World Series, where Scott went 4 for 11, including a Game 7 triple against Bob Gibson, though the St. Louis Cardinals won. Boomer and his home runs, which he called “taters,” took their place in Red Sox history, along with Carl Yastrzemski’s American League Triple Crown and Jim Lonborg’s dominance on the mound. Known for his glove, “Black Beauty,” and for his fielding prowess, Scott earned the first of his eight Gold Glove Awards at first base that season. After the 1971 season the Red Sox traded Scott, Lonborg, and four others to the Milwaukee Brewers. In 1975 Scott led the American League with 36 home runs and 109 runs batted in. After five seasons in Milwaukee, Scott returned to Boston for the 1977 season, during which he slugged 33 home runs, recorded 95 RBIs, and scored 103 runs. His second stint in Boston lasted until the middle of the 1979 season, when he was traded to Kansas City. The Royals released him two months later, and he finished out the season with the New York Yankees. Scott played for several more seasons in the Mexican League and then became manager of the Mexico City Tigers. He spent the next two decades managing there and in the Dominican Republic, in Venezuela, and in the North American independent leagues but was never offered a position with a Major League organization. He resented that snub for the rest of his life. In his fourteen years in the Majors, Scott boomed 271 home runs and drove in 1,051 runs. He amassed 1,992 base hits and a lifetime batting average of .268. He was named to the American League All-Star Team three times and is a member of the Boston Red Sox Hall of Fame and the Mississippi Sports Hall of Fame. He died in Greenville on 28 July 2013.